The 2019 Jeep Cherokee doesn’t just know adventure. It was built for it. Come along for the ride at Bob Moore Chrysler Dodge Jeep RAM of Oklahoma City. As part of the most versatile SUV lineup on the market, the new Jeep Cherokee in OKC offers a dynamic set of power options. Its standard engine, a 2.4L Tigershark® MultiAir® 2, provides exceptional fuel economy at an EPA-estimated 31 highway MPG. That kind of efficiency makes the 2019 Volkswagen Tiguan look like an excessive gas guzzler. Drivers can also opt for an available 3.2L Pentastar® V6 that kicks out 271 horsepower and 239-lb.-ft. of torque. When equipped with an optional tow package, it’s capable of a massive 4,500 pounds of towing capacity. Finally, there’s the all-new 2.0L Turbo engine, offering drivers the best of both worlds – an EPA estimated 31 highway MPG and up to 4,000 pounds of towing capacity. Explore the 2019 Jeep Cherokee and all of its options today. Visit Bob Moore Chrysler Dodge Jeep RAM – a trusted car dealership in Oklahoma City, serving Edmond and Yukon, OK. While the new 2019 Jeep Cherokee is great for your daily commute, it’s capable of a whole lot more. Its front and rear independent suspensions, along with a lightweight, high-strength steel structure, combine for an exciting ride that makes the long way home a lot more fun. Of course, fun tends to take you off the pavement, and that’s just fine with the Jeep Cherokee. It offers a wide range of optional off-road technology for better traction, maneuverability and flexibility, as well as higher ground clearance and water fording capability. Choose from a range of 4X4 systems, including Jeep® Active Drive I 4×4, Jeep® Active Drive II 4×4 and Jeep® Active Drive Lock 4×4. For even more off-road capability, the new Jeep Cherokee also offers an available Jeep® Selec-Terrain® Traction Management System with 5 drive modes – Auto, Sport, Snow, Sand/Mud and Rock. Other versatile features include optional tow hooks and skid plates. Don’t limit yourself to man-made roads. Blaze your own trails in the new 2019 Jeep Cherokee. Visit your certified Jeep dealership in Oklahoma City, OK – Bob Moore Chrysler Dodge Jeep RAM of Oklahoma City. Unlike most SUVs, the 2019 Jeep Cherokee offers the versatility to keep up with today’s family. With spacious seating for 5 and 24.6 cubic feet of cargo capacity behind the rear row, it’s always easy to get up and go. The Jeep Cherokee also offers sliding, 60/40 split-recline rear seats for up to 54.9 cu. ft. of max cargo space. Along with an available power liftgate and a hidden load floor, the storage options are seemingly endless. To ensure everyone stays connected on the road, the 2019 Jeep Cherokee also offers plenty of cabin tech. Along with a 7-inch Uconnect® infotainment system, the mid-size SUV comes standard with Apple CarPlay™ and Android Auto™. These cutting-edge smartphone integration features offer a number of mobile functions, including a wealth of music streaming options. For exceptional quality when you’re listening to your playlist, opt for the Jeep Cherokee’s available Alpine® premium audio system. This mid-size SUV provides standard Bluetooth® technology as well, delivering voice command options and more. Drivers can also opt for SiriusXM® Satellite Radio and Traffic Service, HD Radio®, GPS Navigation and more. For an SUV that’s built for families on the go, visit your preferred car dealership in Oklahoma City, OK. Test drive the new 2019 Jeep Cherokee at Bob Moore Chrysler Dodge Jeep RAM of Oklahoma City. Whether you’re traveling down the highway or taking the road less traveled, the 2019 Jeep Cherokee provides optimal safety for every journey. The 2019 Jeep Cherokee mid-size SUV provides standard Electronic Roll Mitigation, All-Speed Traction control and Hill Start Assist for enhanced stability on any terrain. For increased safety during your daily errands, the Jeep Cherokee also provides a standard ParkView® Rear Back Up Camera. For added awareness, car buyers can opt for a host of driver-assist features as well. These advanced safety features include available LaneSense® Lane Departure Warning, Full Speed Collision Warning with Crash Mitigation and Blind-Spot Monitoring with Cross-Path Detection. A standard LATCH Ready Child Seat Anchor System and an Enhanced Accident Response System are also included for complete family safety. For a trustworthy SUV, visit your trusted car dealership in Oklahoma City, OK. Visit Bob Moore Chrysler Dodge Jeep RAM of Oklahoma City and test drive the 2019 Jeep Cherokee today. Not all Oklahoma City, OK drivers are the same. Luckily, every 2019 Jeep Cherokee is different as well. 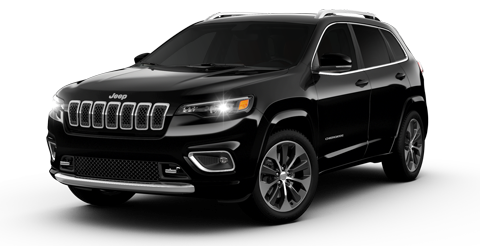 The mid-size SUV offers a total of 7 trim levels – Jeep Cherokee Latitude, Latitude Plus, Altitude, Trailhawk®, Limited, Trailhawk® Elite and Overland. While every trim offers premium standard features, they each offer their own defining qualities as well. The Jeep Cherokee Latitude Plus adds captivating ambient LED interior lighting, as well as cloth and premium vinyl seating. Meanwhile, the Jeep Cherokee Overland adds an enhanced elegance. The classy trim provides a Zebrano wood-accented steering wheel and Nappa leather-trimmed upholstery with the Overland logo imprinted on each seat. For a more rugged appeal, the Jeep Cherokee Trailhawk offers accent color roof rails, 17-inch x 7.5-inch and, of course, Trail Rated® off-road capability. If you’re searching for a new car, truck or SUV near Yukon and Edmond, OK, you don’t have to settle. 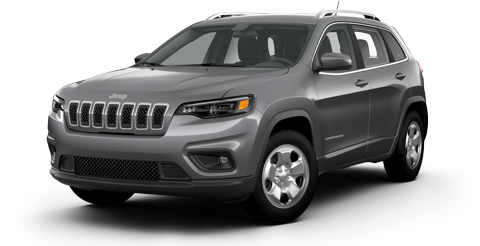 Explore a variety of 2019 Jeep Cherokee trim levels today at Bob Moore Chrysler Dodge Jeep RAM of Oklahoma City – your hometown car dealership in Oklahoma City.